St. Thomas the Apostle N.S. is an 8 teacher school with a current enrolment of 151 pupils. Our children partake in lots of activities during the school year. Congratulations and Good Wishes to Mrs Catherine Moloney who is retiring from St Thomas the Apostle National School. Congratulations to the children of St Thomas the Apostle NS who received their First Holy Communion on Saturday 12th May. St. Thomas the Apostle NS Board of Management and Staff hosted a hugely successful fashion show in the Community Hall. 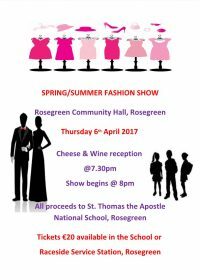 There will be a fashion show run by Board of Management of St Thomas the Apostle National School on Thursday 6th April. Today we took part in the 10@10 which we completed for Operation Transformation. Our annual Carol Singing in aid of St. Vincent de Paul took place in Morrissey’s Supervalu, Cashel. Our Christmas Plays took place on Tuesday 13th and Wednesday 14th December. We held a Matinee Show on Monday 12th December. The plays were a huge success. Well done to all involved! Well done to everyone who participated in the Cross-Country this year. We were very successful winning both Individual medals and Team Medals. 5th & 6th Class Boys were invited to attend a special training opportunity in Semple Stadium, called Gaelic Games Promotion Day organised by CBS Thurles. Students from 6th Class were invited to visit Coolmore Stud Farm. Members of the Green School Committee were awarded the Green School Flag for Water in Kilkenny. We received our National Flag from members of the Defence Forces. This was a very special occasion marking the Centenary of the 1916 Rising. The youngest child and the eldest child in our school were chosen to raise the Flag on this very special day.